Changeable cloudy weather is forecast for February 7, the Ministry of Ecology and Natural Resources reported. Gentle north-west wind will waft. The temperature will be 0-3?C at night, +8-13?C in daytime in Absheron peninsula, +1-3?C at night, +10-12?C in the daytime in Baku. Air pressure records 768. Relative humidity will be 80-90% at night, 50-60% in the afternoon. 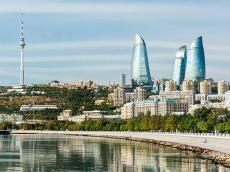 The weather will be rainless in the regions of Azerbaijan. It will be foggy in some places. West wind will blow. The temperature will be -2+3?C at night, +9-14?C in daytime, -3+2?C in mountains at night,+6-11?C in daytime. Weak and mild hesitation of the meteorological factors reigning on February 7 in Absheron peninsula will be favorable for weather-sensitive people.